Somehow, he’s found himself stuck in an Alessi Jar! He’d better hold on tight…This durable glass jar is perfect for storing anything, from pasta to rice and even cookies, and seals tight to keep your food fresher for longer, thanks to its plastic lid and rubber seal. Pop the jar in your kitchen benchtop or pantry, and bring a touch of playfulness to your home, while ensuring that your food remains fresh, and within arm's reach at all times. 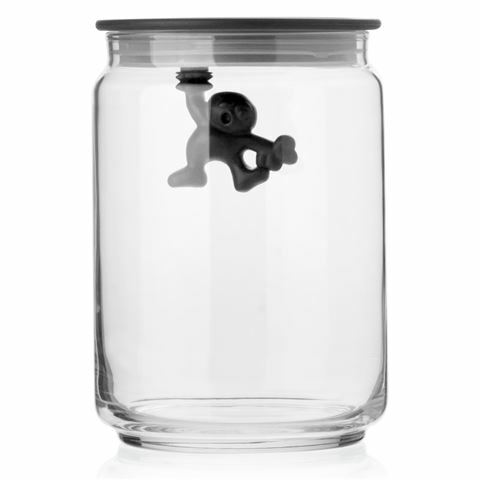 Help Gianni by filling the jar with your favourite food to break his fall! Lid made from plastic, with rubber seal. Jar is airtight when closed. Designed by Mattia Di Rosa.